Ciaran Clark’s early header ensured the Republic of Ireland’s preparations for the Euro 2016 finals began with a victory as Switzerland fell by the wayside in Dublin. Clark, who is struggling to get a game for Barclays Premier League basement boys Aston Villa, struck with a second-minute header to double his international tally and send a Good Friday crowd of 35,450 home from the Aviva Stadium with smiles on their faces. On a night when manager Martin O’Neill – who this week landed himself in hot water over his comments about WAGs – handed senior debuts to Alan Judge, Eunan O’Kane and Jonny Hayes, it was not always pretty, but ultimately proved effective as his side extended their run to one defeat in seven games this season. O’Neill will experiment once again on Tuesday night when Slovakia head for the Aviva, but he will do so having learned a little more about some of the men on the periphery of the group of players he will take to France this summer. He had promised to use the depth of his squad in the two friendlies having admitted there are some, if a limited amount, of places up for grabs in his squad for the finals. To that end, he handed Brentford midfielder Judge a first senior cap and central defender Shane Duffy a second after a gap of almost two years, although he stuck with the man who ended the qualifying campaign in possession of the goalkeeper’s shirt, Darren Randolph, still between the posts as Rob Elliot awaited his latest opportunity. Duffy, whose only other appearance for his country came against Costa Rica in an end of season friendly played in Philadelphia, needed less than two minutes to make a telling contribution when he met Robbie Brady’s corner and helped it on towards central defensive partner Clark, who gleefully headed home from point-blank range. Kevin Doyle saw a clever back-heeled attempt from Aiden McGeady’s 11th-minute corner blocked on the line as Ireland caught the visitors napping once again from a set-piece, although they were almost undone themselves in similar fashion when striker Haris Seferovic only just missed the target from Blerim Dzemaili’s 17th-minute delivery. Colorado Rapids frontman Doyle’s evening ended prematurely and painfully when he was carried from the pitch after a rugged challenge by Norwich defender Timm Klose, although Daryl Murphy’s introduction as his replacement presented the visitors with similar problems. 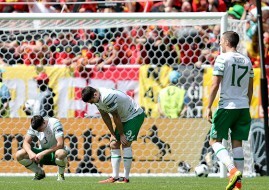 The Swiss looked intensely vulnerable when the ball was played into the box and they might have fallen further behind eight minutes before the break when Shane Long thumped a header against the bar from skipper for the night Seamus Coleman’s cross and was then unable to generate enough pace to trouble relieved keeper Yann Sommer from the rebound. In the meantime, the visitors had gone close themselves when the dangerous Seferovic unwittingly deflected Granit Xhaka’s shot towards goal, but Randolph proved equal to the task. Switzerland re-emerged knowing they would have to improve significantly if they were to force their way back into the game, and they had an opportunity when they were awarded a 51st-minute free-kick wide on the right, although Randolph claimed Ricardo Rodriguez’s ball into the box with commendable confidence. The visitors continued to enjoy a greater share of the possession, although were rarely able to do anything of note with it, although Clark had to produce an immaculately-timed 56th-minute interception to deny Breel Embolo a shot at goal from Dzemaili’s nicely weighted through ball. O’Neill handed debuts to Bournemouth’s O’Kane and Aberdeen’s Hayes as they and James McCarthy replaced David Meyler, McGeady and Stephen Quinn with 29 minutes remaining, but his side might have been pegged back within five minutes when the lively Dzemaili got his head to a left-wing corner, but could only pick out Randolph. Switzerland might have snatched a draw six minutes from time when Ireland lost their bearings for once, but substitute Shani Tarashaj scuffed his effort wide, much to the relief of the wrong-footed Randolph.